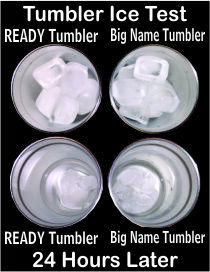 Super insulated stainless steel tumbler with a rubber gasket seal to insulate and hold the lid securely in place. Unmatched ability to keep beverages hot or cold compared to plastic tumblers or lesser quality mugs. The READY travel tumbler keeps drinks hot or cold as well as Yeti™ and our tumblers include personalized laser engraving that leaves a black image. 20 ounce size.